“Vibration will do anything. It would only be necessary to step up the vibrations of the machine to fit the natural vibration of the building and the building would come crashing down. That’s why soldiers break step crossing a bridge. On the occasion of his annual birthday celebration interview by the press on July 10, 1935 in his suite at the Hotel New Yorker, Tesla announced a method of transmitting mechanical energy accurately with minimal loss over any terrestrial distance, including a related new means of communication and a method, he claimed, which would facilitate the unerring location of underground mineral deposits. At that time he recalled the earth-trembling “quake” that brought police and ambulances rushing to the scene of his Houston Street laboratory while an experiment was in progress with one of his mechanical oscillators. 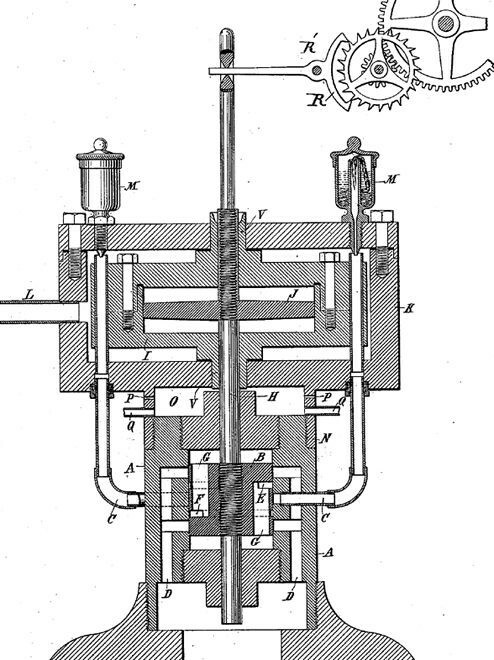 Tesla's mechanical power transmission system, he dubbed it the "art of telegeodynamics," was based primarily upon his reciprocating engine invention, patent US514,169 - Reciprocating Engine - February 6, 1894. 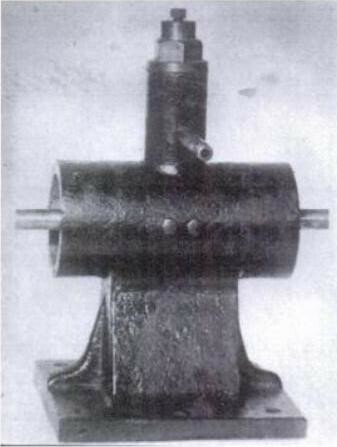 While the fundamental operating principles of Tesla's mechanical oscillator are well understood, little has been said about how the machine would have been used for underground prospecting. The electromechanical oscillator was originally designed as a source of isochronous (that is to say, frequency stable), alternating electric current used with both wireless transmitting and receiving apparatus. In dynamical system theory an oscillator is called isochronous if the frequency is independent of its amplitude. An electromechanical device runs at the same rate regardless of changes in its drive force, so it maintains a constant frequency (hz). I will have to give credit to Dr. Tesla for the design of the oscillator. I will however submit a crude representation of his his work. 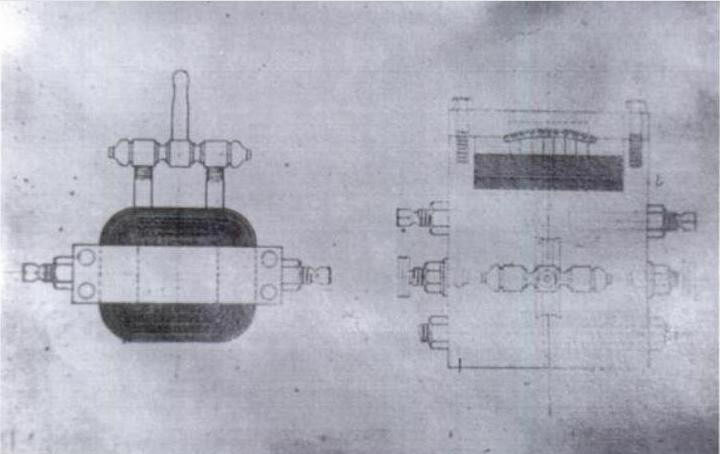 Keep in mind the diagram is not to scale, the actual piston in the oscillator moved a distance of [ 1/ " up to 3/8"]. You may notice the lower part of the fraction under the one is missing. I have not seen a book with the actual number printed so this is somewhat of a mystery to be solved. It could be as little as 1/ 1000 and the printer could not print the number. One of the major features of the oscillator is that it could move massive weights (coils) with little energy input. This was due to the small movement of the piston combined with the spring effect produced by the piston slamming into a closed chamber. 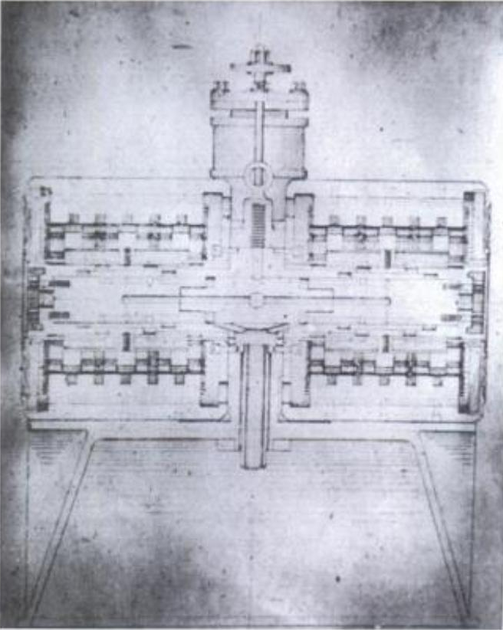 The air inside the chamber compressed and acted as a spring, forcing the piston to travel the opposite direction. At the same time this occurs the slot on the piston aligns with the inlet to allow high pressure working to propel the piston like a rocket toward the other end where it once again slams into an "air spring". The diagram does not show the electromagnetic coil system that also controls the frequency of the piston. I will submit an additional diagram soon as I can. Two electromagnets positioned on either side of the shaft. In the drawing the coils appear to be about one foot in diameter. The shaft has two coil pairs attached to either end which are on either side of the electromagnet fields when the shaft is at rest. When the shaft is given a slight tap, the coils are forced into the electromagnetic field. When one coil enters the field, it energizes a coil on the opposite side of the shaft producing an oscillation in the coils, somewhat similar to the oscillation produced in (oddly enough) a Tesla coil. Also similar to the Tesla coil, a capacitor arrangement is mentioned that provides electricity for the field coils. 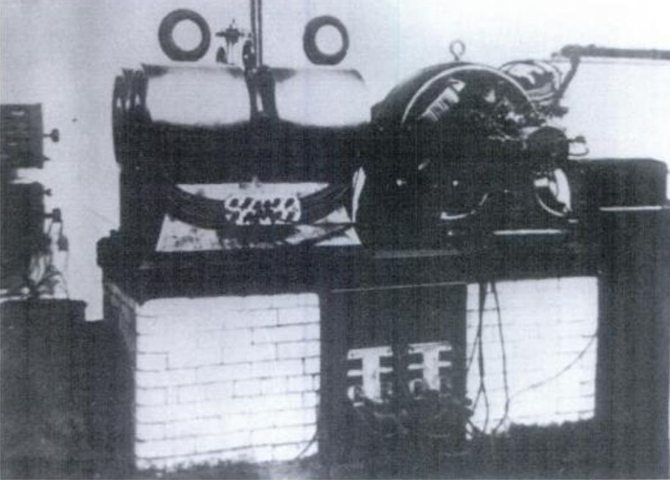 Large electromagnetically controlled mechanical oscillator for generating isochronous oscillations, used in demonstration before the Electrical Congress at the Chicago World's Fair, August 25, 1893. Illustrated in Martin book, Fig 312, p.490. Here is an actual picture of the electro-mechanical oscillator. Note the size of the field magnets. They were constructed of numerous flat sheets of iron. Using flat sheets of iron, as opposed to a single piece of iron, increases the magnetic field. Recent research with permanent magnets and permanent magnet, electromagnetic combinations could greatly increase the work done by the oscillator. In Dr. Tesla's machine, current is provided for the field coils by the generator. By using a permanent or combination magnet arrangement current for the field coils could be reduced, resulting in a greater output. 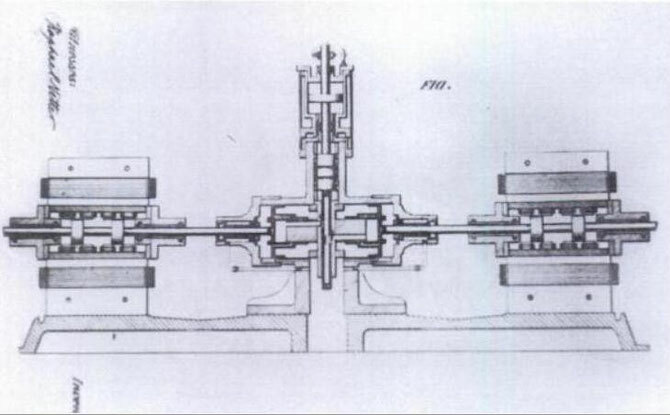 Motion of the piston was controlled in three different methods. 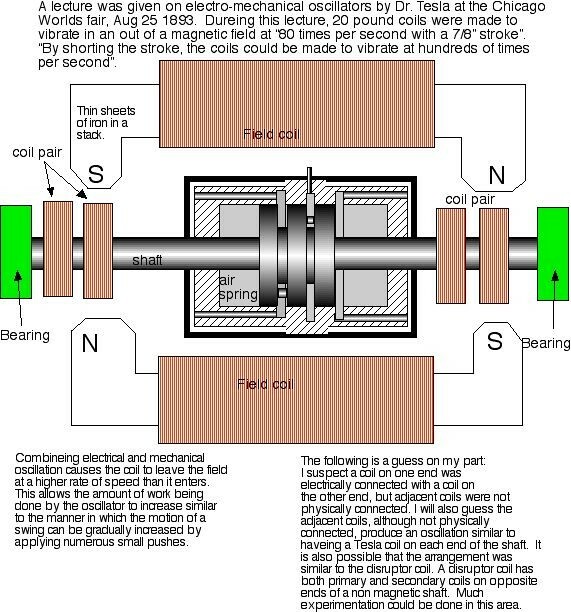 Connecting the coil pairs on either end of the shaft, forces the coil on the opposite end into the field when it is at full charge, resulting in the coil being repelled from the field at the same speed it enters the field. 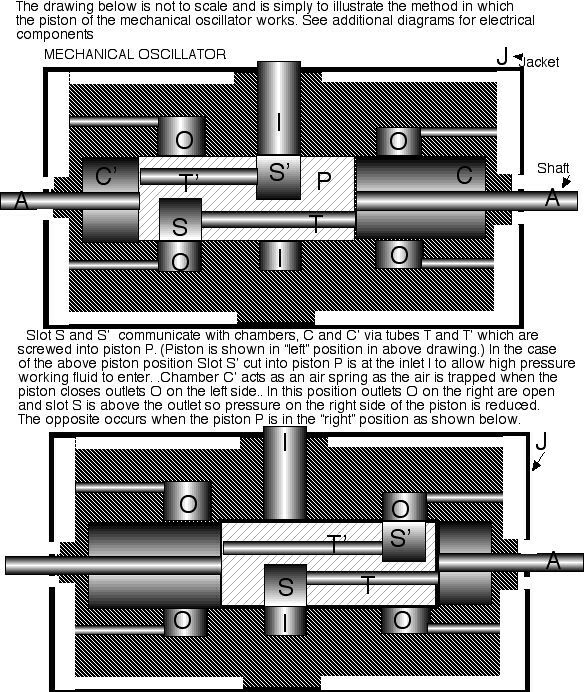 The motion of the shaft is also reversed mechanically by both the air spring and pressure from the working fluid. Either steam or air can be used to drive the piston. If steam is used, a vacuum is created when the steam enters the jacket and condenses. The vacuum created at the outlet pulls the piston in addition to the steam push on the other end. The most important part of the picture cannot be illustrated but can demonstrated. The resonant frequency of the machine could be adjusted to match the resonant frequency of any object. Dr. Tesla was able to match the resonant frequency of objects in the room by adjusting either the electrical or mechanical movement of the piston. He was able to identify different objects in a circuit by matching their resonant frequency. 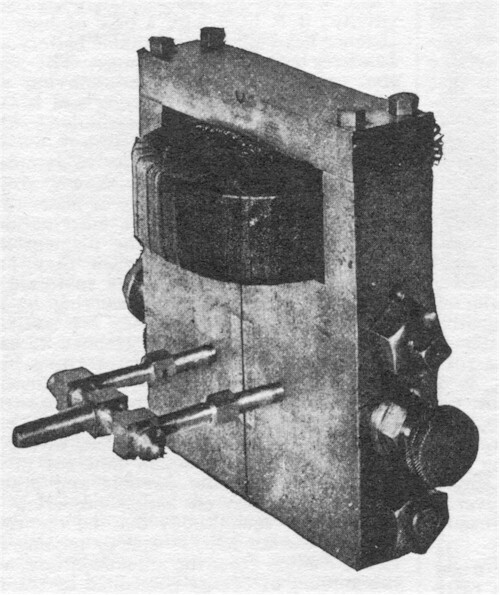 The mechanical oscillator had to be mounted on wooden blocks to help damp vibration. Dr. Tesla also showed parts of a steel arbor that had been torn apart with one of his oscillators. Fig. 313. 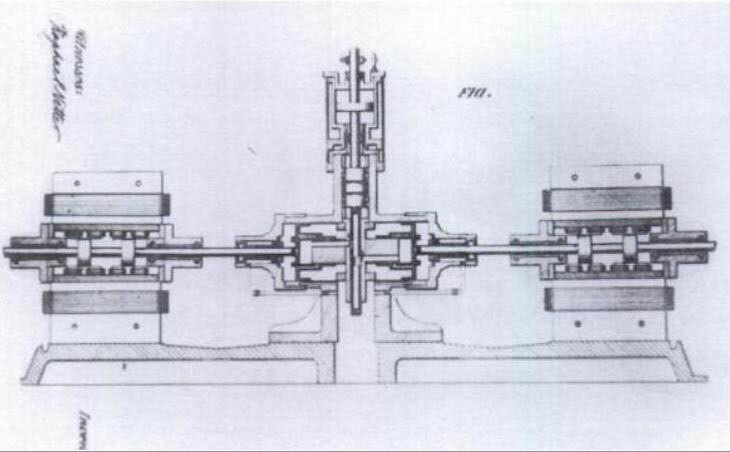 Diagram of working parts of early form of Tesla oscillator, as if seen from above, in section. (From "The Electrical Engineer," by permission. Fig. 27. 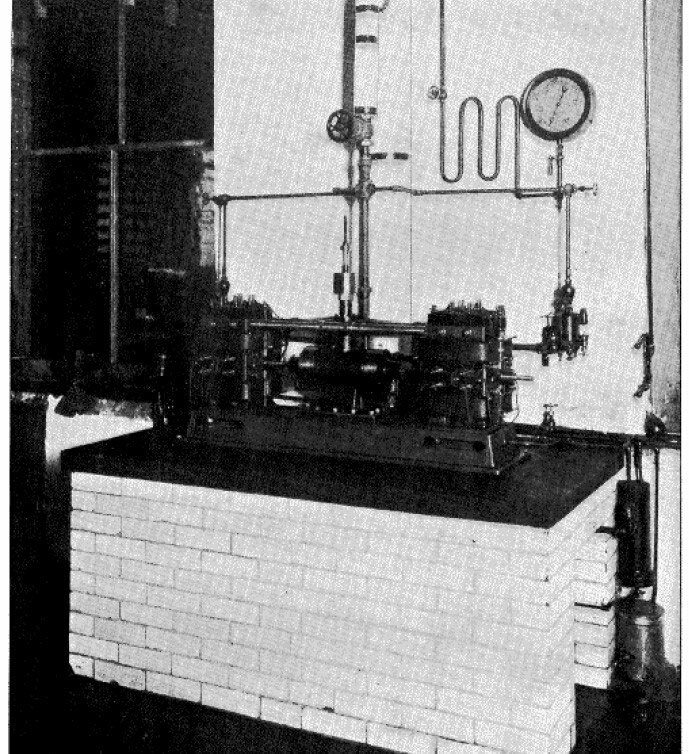 Large mechanical and electrical oscilator with four vibrating parts installed in the laboratory at 46 E. Houston Street, for furnishing isochronous currents of desired wave frequencies, phases and beats. Elechtro-mechanic oscilator used in many experiments. Fig. 29. Small high frequency mechanical and electrical oscillator used in many investigations. 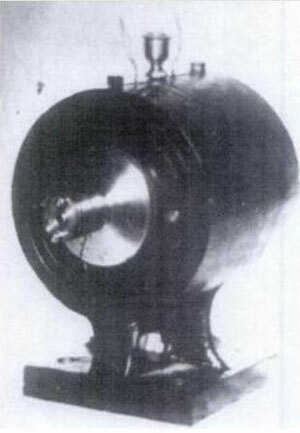 Unique Alternating Current Generator or Exciting Tesla's Early "Beat" Receptor. Actuated by Comprest Air or Steam Which Vibrates a Special Diafram-Coil. "That oscillator (Fig. 29) was one of high frequency for isochronous work, and I used it in many ways. The machine, you see, comprised a magnetic frame. The energizing coil, which is removed, produced a strong magnetic field in this region. I calculated the dimensions of the field to make it as intense as possible. There was a powerful tongue of steel which carried a conductor at the extreme end. When it was vibrated, it generated oscillations in the wire. The tongue was so rigid that a special arrangement was provided for giving it a blow; then it would start, and the air pressure would keep it going. The vibrating mechanical system would fall into synchronism with the electrical, and I would get isochronous currents from it. That was a machine of high frequency that emitted a note about like a mosquito. It was something like 4,000 or 5,000. It gave a pitch nearly that of my alternator of the (first) type which I have described. Of course this device was not intended for a big output, but simply to give me, when operating in connection with receiving circuits, isochronous currents. The excursions of the tongue were so small that one could not see it oscillate, but when the finger was pressed against it the vibration was felt". 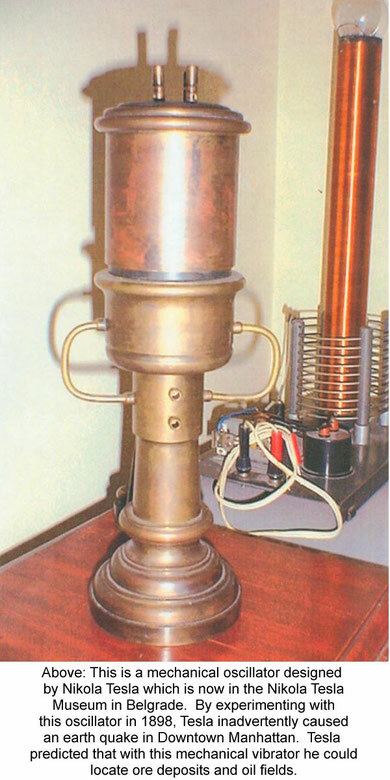 Latest form of Tesla oscillator, combining in one mechanism the dynamo and steam engine. 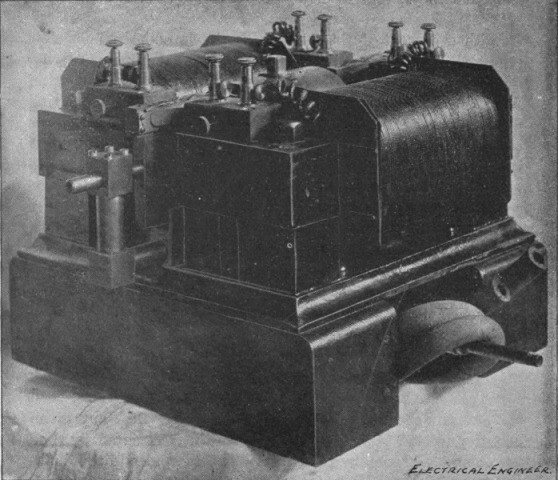 Double compound mechanical and electrical oscilator for generating current of perfect, constant, dynamo frequency of 10 horsepower (Tesla’s Oscillator and Other Inventions by Thomas Commerford Martin - Century Magazine - April, 1895 - Fig. 2, p.121). 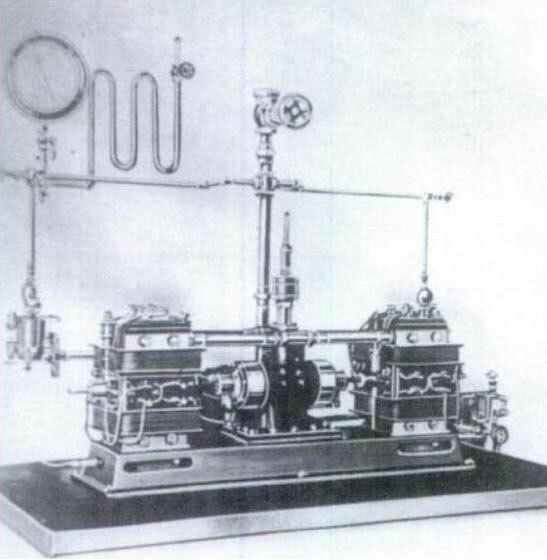 Double compound mechanical and electrical oscilator for generating current of perfect, constant dynamic frequency current of 10 Horse power, built in 1893. (Article by Martin - "Tesla's oscilator and other inventions" Century Magazine April 1895, Fig. 2, Pg.921. Diagramatic representation of double compound mechanical and electrical oscilator for generating currents of perfectly dynamo frequency. Shows mechanical and electrical parts. Why hasn't this been tried by anyone so far? I might be wrong, people would've but hasn't there been any success?